Things have been a bit busy around here the last couple of days. I'm been working on a few projects for a challenge I was asked to particpate in. More on that next week. Anyhow, my little sis came to my rescue today and this is a tutorial she tried out. 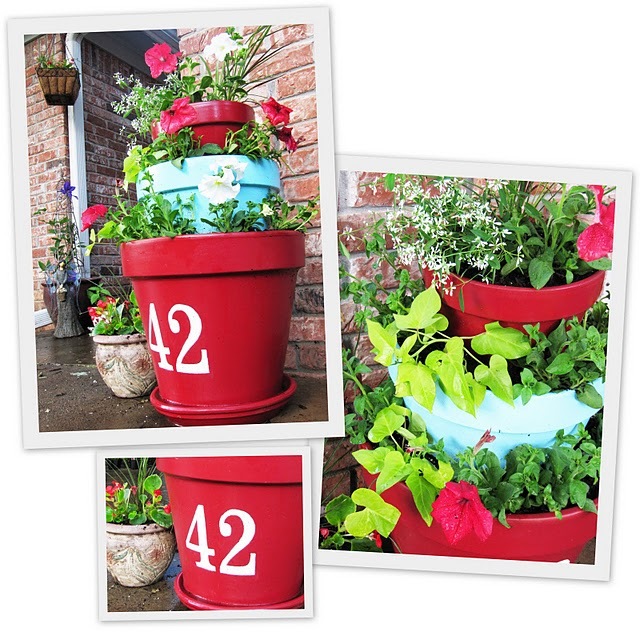 This beautiful tiered pot project is from Amy at Positively Splendid. Isn't it fun? Her tutorial is great. ...and sprayed them with this. I love how they are just oozing with flowers. If it weren't so heavy I think I'd steal it for my house. Thanks for your help, Cass. Click HERE for Amy's wonderful tutorial. Now on to our "You Roared" segment. 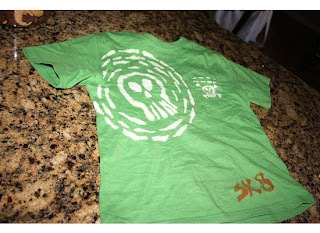 April from April's Craft Nest made these great freezer paper stenciled tees. See what she did so she could make two tees with one stencil? Super smart. Christy made this bleach pen tee for her son. Pretty rockin'. Sarah from Sunshine Mama made these anti-layer tube tops. I love how she made some striped ones. Liz from Living my Sweet Life made the Born to Ride tee and the Robot tee. Great work! Becky from Becky's Craft Closet made the JCrew-inspired tee. I love it on blue. More than Just a Mom made a fabulous scrappy belt. 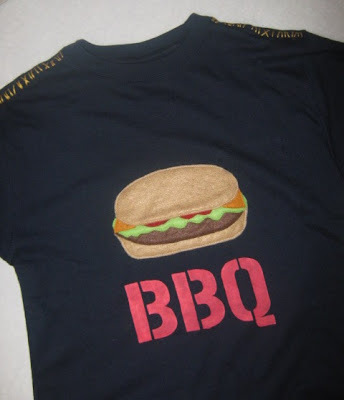 Jen from Dangerously Domestic made this adorable BBQ tee using freezer stenciling and felt. She's got a full tutorial for it if you drop by her site. 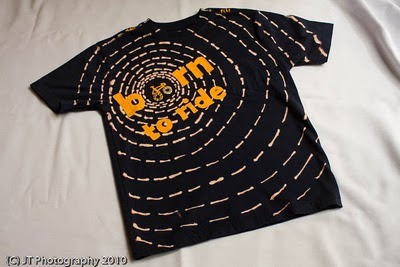 Jamie from Pure Joy made this Born to Ride tee. I like how she put the text at an angle. Rachel from Holy Craft made this super cute VW Bug tee using freezer paper stenciling. Really well done! Thank you SO MUCH to all of you who are making stuff and showing it to me. That's the fun part for me. We're going to have to do the rest of "You Roared" later, since I'm having problems with flickr right now. I'll post some soon though. The flickr group has some great stuff in it that I want you to see. That's all for now. Thanks for coming to visit. Hope you have a terrific weekend. So many craft projects!! I don't know where to begin!!! I love the planters. That would look great in my back yard. I love all the things that so many people made. I love how you have inspired so many people to craft. Sometimes it just takes a good idea to spark that crafting fire. Way to go everyone-- very impressive! Thank you so much for highlighting my tiered planter tutorial! Your sister's rendition of it is gorgeous! I absolutely adore your blog. Have a terrific weekend! Thank you for including me today!! These are great! So many good ideas! Going to have to try that tiered planter (love the colors!). I can't wait to try a paisley tee for me too. Thanks so much for including my striped tube tops! these are such great links! thanks for sharing!